With over 24 years of trading we’ve got plenty to shout about – here’s a selection of some of our most exciting, challenging and fulfilling events to date. Back in August this year Laura was given the amazing challenge of organising a new client’s Summer Party at their office Head Quarters for 220 people. The team put their thinking caps on and executed a fantastic festival theme, centering around colour, excitement, activities, food, drinks and dancing. It was an early start for the team who were onsite from dawn managing all elements of the event from start to finish, seeing the festival spectacle unravel! The guests were greeted by rows of colourful flags, bubbleogists and a glass of Prosecco or beer from the trendy Prosecco van. After a quick formal speech, the fun started with very competitive outdoor games and we even managed to pull all strings, speak to the weather man and arrange a nice sunny afternoon! 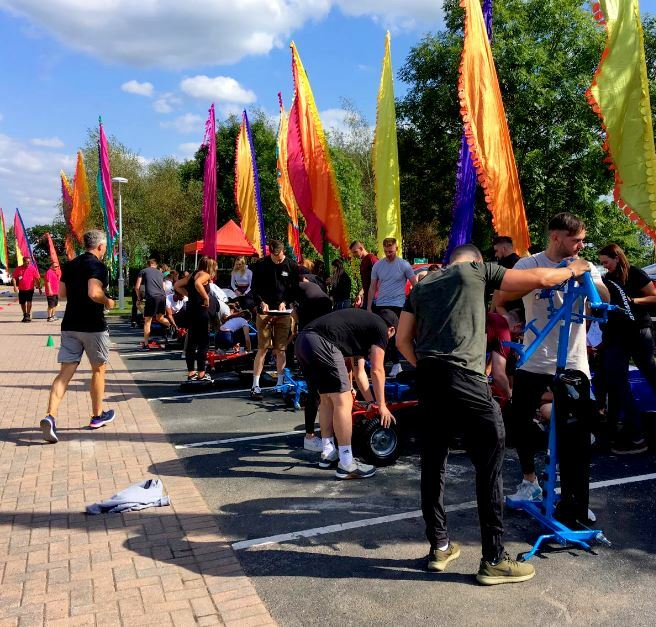 The main activity was ‘Race to Success’, where teams raced against each other to build a go kart, decorate it and race through an obstacle course – to say the teams were competitive was an understatement! There were also other activities running along side such as Air Hockey, Splat the Rat, Quiots, Basketball Shootout, Table Football and Giant Games. Once the activities had finished it was time to go inside and see what magic the team has been creating behind closed doors. The guests were greeted by vanity stations with therapists ready to do hair and makeup and glitter artists making sure everyone was glam for the festival ahead. As these moments need to be pictured and celebrated there was also a selfie mirror, giant games, Scaletrix, a beer bar, cocktail bar and gin bar (just to quench the thirst before dancing!). When it was time to eat the guests were able to choose from a incredible selection of ‘around the world’ food stalls, which were all delicious! There was fish and chips, burgers, paella and Mexican followed by crepes, waffles and popcorn – something for every taste bud! The team transformed the courtyard into a mini concert; with colour changing LED globes scattered around and festoon lights hanging from above as well as a stage with 3 LED screens. All the acts were amazing with DJ Oli and Dan the Saxman getting the party started, followed by Afishal; a visual DJ drummer and the party ending with the main act; Wretch 32. 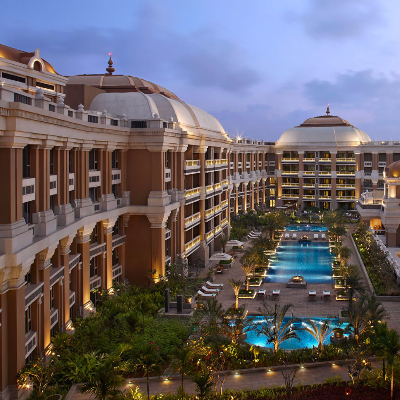 Earlier this year Magdalen was tasked to organise a 4 day international conference to India for one of our local clients; this encompassed two full days of meetings onsite at the amazing ITC Grand Chola Hotel and two days off-site visiting the client’s new facility in Chennai. Planning for this event started by ensuring that the ‘meet and greet’ transfers at the airport was second to none and that everything was ready and waiting for delegates to arrive. The first activity (bright and early in the morning to avoid the hot sun!) was a visit to the Mahabalipuram (a UNESCO world heritage site). After a very interesting morning the group stopped and refuelled for lunch at The Wharf Radisson Temple Bay Resort before visiting the Dakshinchitra Museum. The day was finished by heading back to the hotel for all guests to put their feet up and relax ahead of the start of the conference! One of the highlights of the trip for the delegates was the dinners and the traditional Indian cuisine. The first dinner that we organised was at The Royal Vega where all guests were in for a treat with a sumptuous Indian feast. The group also had the delight of dining in Peshawri (a traditional restaurant) where not only were the plates made of banana leaves and guests eat with their hands but each guest was given a special bib with their company logo! 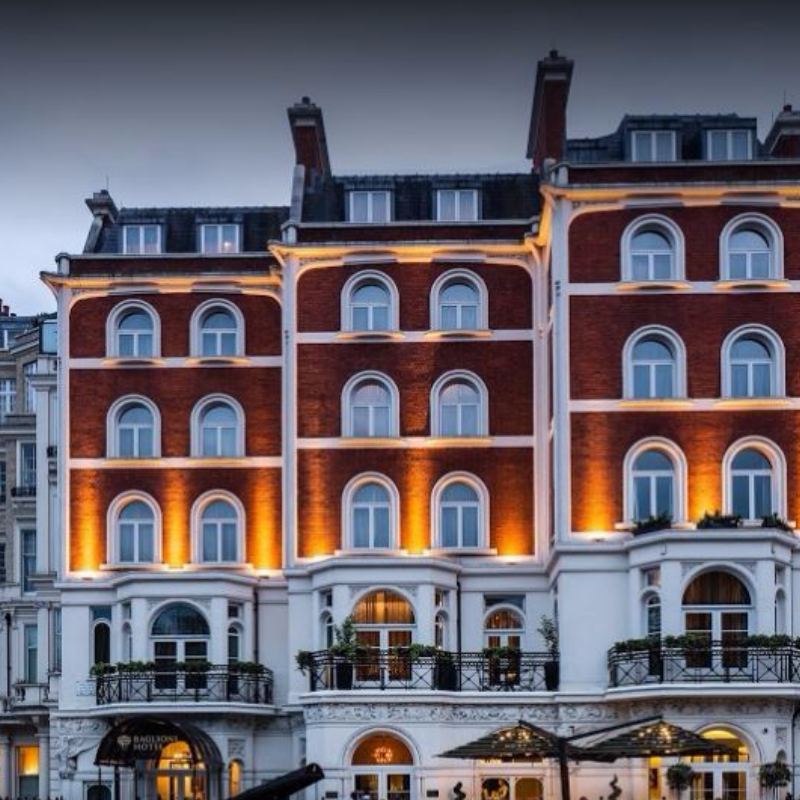 Overall the trip was very successful and this was made possible by the attention to detail and the importance on making sure all delegates received an authentic experience as well as the venue being on top of its corporate game! 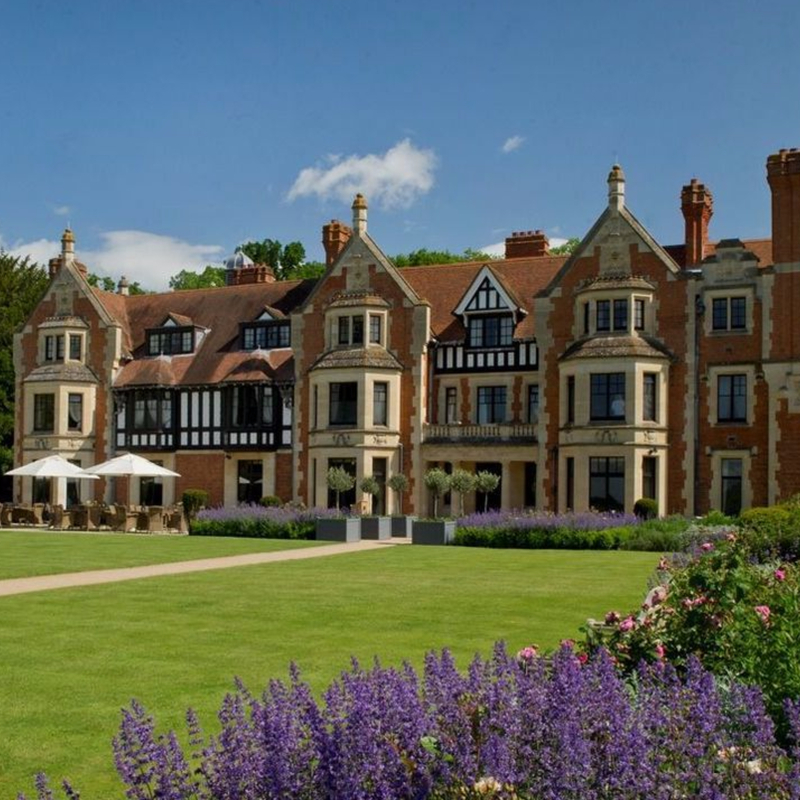 Chloe has been supporting one of our new clients with their Press Launch Event at The Wood Norton Hotel and Eastnor Castle. It all started with a very detailed meeting with the hotel team to go over all the final details (even the gardener came to say hello!) After much preparation on the stage was set for what would be some very eventful days to come! Guests arriving the following morning were not put off by the weather, meeting in the morning for a presentation from the UK PR Manager before embarking on a driving adventure – including some serious off-roading and a night drive in the beautiful surroundings of Eastnor Castle. Friends of the brand Sir Ranulph Fiennes and explorer and endurance athlete Ben Saunders came to support the launch and mark the occasion with engaging after dinner speeches. The sun shone for yet another successful drive followed by some drinks and mingling in the bar (the guests, of course!) before heads were rested on the cloud-like pillows at The Wood Norton. After a brief down day on Friday we arrived at the weekend where we hosted the brand’s lifestyle guests– a lot of preparation went in to achieving a fun filled weekend of BBQ’s, catapult lessons with mountaineer and adventurer Kenton Cool and a thrilling off-road expedition as guests brought along their partners and kids of a day of serious fun! 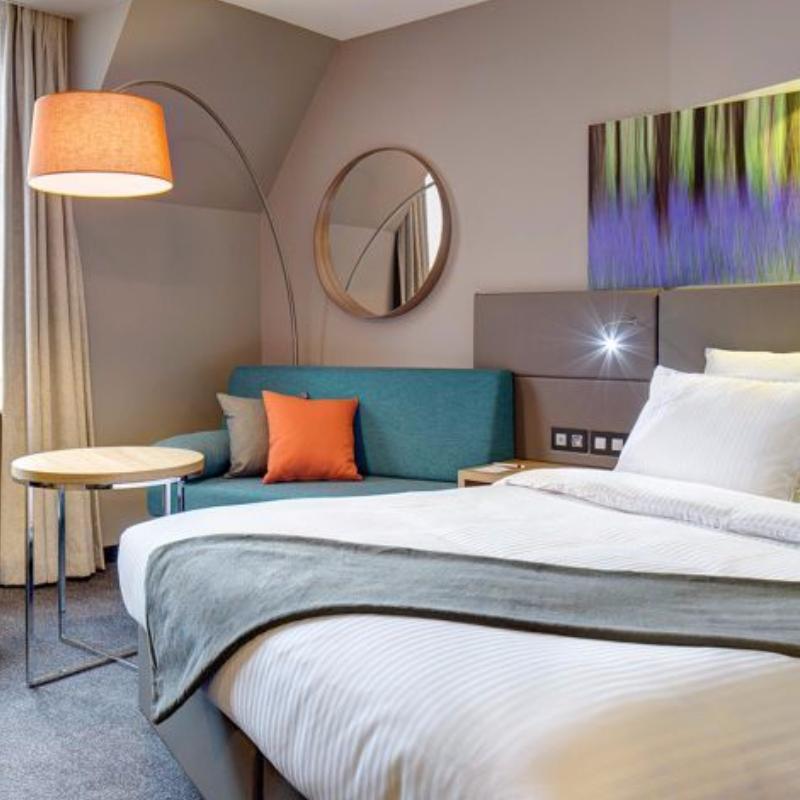 Saturday evening was rounded off with a delicious meal in the Fleur de Lys restaurant at The Wood Norton, and some very lucky mummy’s enjoyed a relaxing breakfast in bed on Sunday morning for Mother’s Day! 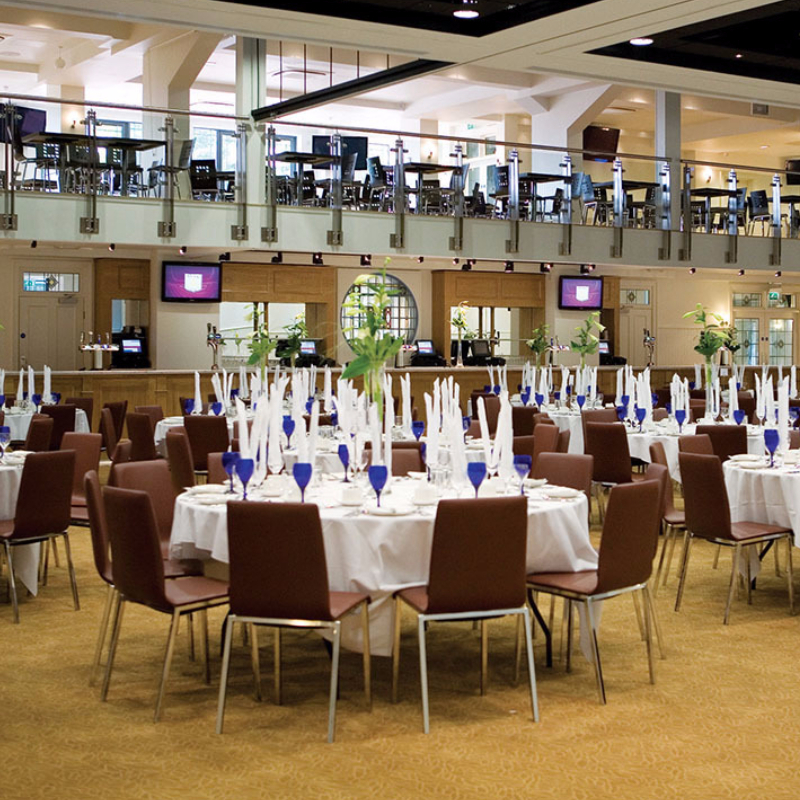 The Wood Norton has proven itself to be a fantastically versatile venue, with nothing being too much trouble and the team always being on hand to help! Thanks to the staff there, particularly Josh who’s been a star, it’s been a brilliant event – bring on the next one! 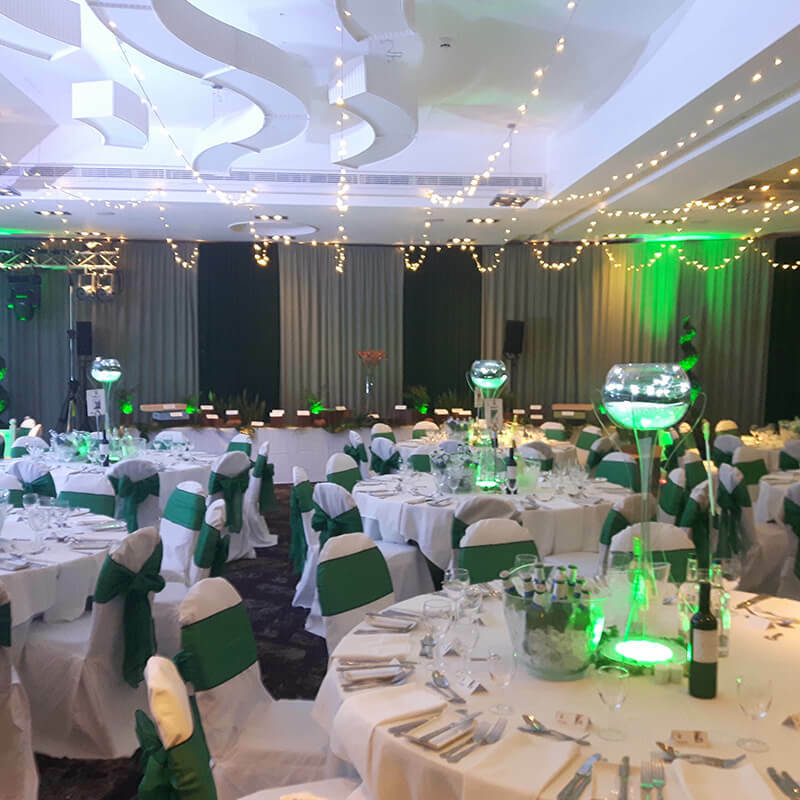 The theme for this Sales Rally evening was ‘I’m A Celebrity…’ so Laura had the fantastic task of designing and implementing a full jungle theme in to a rather ordinary function room – and what a transformation it was! Early the Saturday morning a team of drapers came in to and draped the entire room is soft green fabrics as well as hanging 300m of fairy lights! The table were dressed with fish bowl centre pieces with green uplighters and foliage and the room was dotted with large topiary trees. We also designed and supplied bespoke, themed table plans, table numbers and place cards! The guests had a gourmet BBQ buffet with the buffet table decorated in foliage and jungle flowers. Entertainment for the evening started with two mix and mingle magicians during the drinks reception and three casino tables. Guests were welcomed in to the room (or should we say – jungle!) to a performance by Afishal DJ Drummer. Afishal has taken DJ’ing to a new visual level! As a Visual DJ Afishal plays every single note live on drums! Remixing both audio and visuals on the spot, producing the most incredible live show! Afishal was a huge hit and performed a second set after dinner, inviting one of the guests onto the stage to have a go! The highlight of the evening was a DJ set by celebrity DJ and 90’s boy band star Dane Bowers! The dance floor was soon packed and the guests enjoyed a chat with Dane afterwards. This is the fourth year we’ve worked with the client on this event – and we’re very excited to see what we’ll be designing for next year! The First Choice Conference & Events (FCCE) onsite team set off for sunny Oxford in April 2016, to support our client with their events at the Saïd Business School and King’s Centre. The conference promised “two packed days of talks from a seriously awesome line-up of speakers” so an exciting event for Chloe and the team at FCCE to work on! 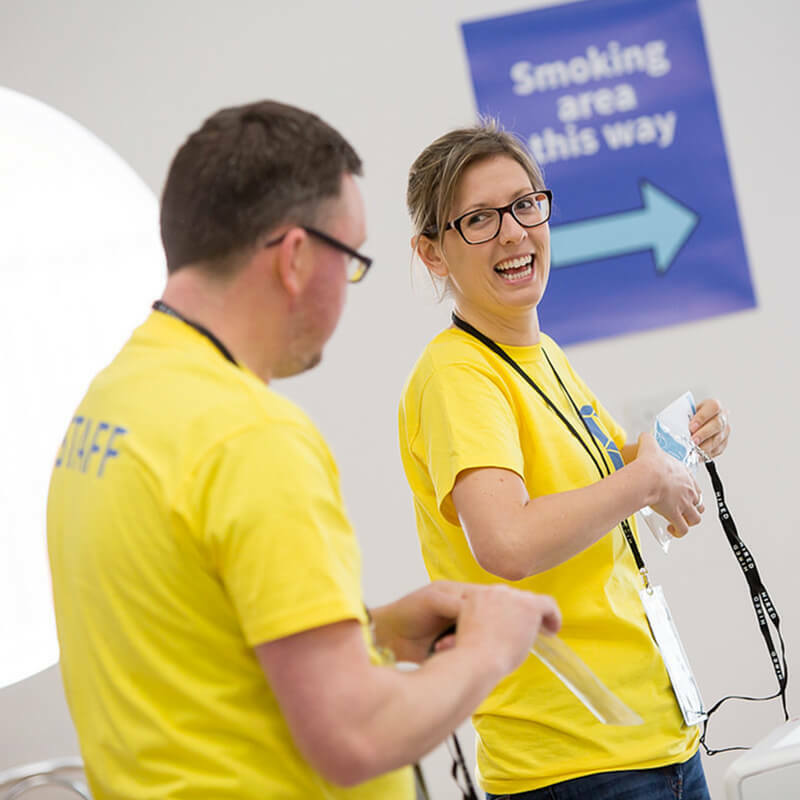 Chloe’s main tasks were to provide the professional and hardworking staff for the event, as well as ensuring all delegates, speakers and staff were quickly and correctly registered on arrival. In the lead up to the event, Chloe worked closely with the client to ensure these two elements were meticulously planned, frequently sharing information and visiting their funky offices in Brixton. Onsite at Saïd Business School and King’s Centre, the FCCE team ensured all the delegates were in the right place at the right time, with the right credentials, as well as ensuring they were fed and watered at the correct times! Working with the professional badging company was a dream for the team (not once did they ‘turn it off, and turn it back on again!’), producing professional badges that were printed onsite in a matter of seconds! A day of talks was concluded by an after-party including music, drinks, table football and a gaming station with PlayStations! The FCCE onsite team were asked to organise a 3 day multi-location trip to Barcelona for our U.K based customer. We arranged an eventful itinerary which merged fun elements with an educational visit to our clients head office. Transportation wise, we arranged a meet and greet for all guests at Barcelona airport (with a chauffeur-driven Sedan for the CEO!) and a private coach for any other journeys. After a group dinner and overnight stay in a central hotel, the guests visited the company plant before having the remainder of the day in Tarragona, with a wealth of ancient remains and religious buildings to explore. In the afternoon, a visit to Cavas Codorniu and a wine tasting was arranged. More food and drink lay ahead in the evening, at boutique restaurant, Attic and its fabulous terrace views of the Ramblas. On the final day, the group were led by a host through a panoramic tour of Barcelona, followed by a wander through a traditional Spanish village before being transferred back to the airport for a return to normal life! We were asked to organise a 6 day multi-location trip for our clients Thai customers. We proposed a fun packed itinerary taking guests to London, Oxford and the Cotswolds. There were many different elements to this event, which was also fully hosted by a member of the FCCE onsite team. Transportation wise, taxis, coaches and cars were arranged for each leg of the trip. 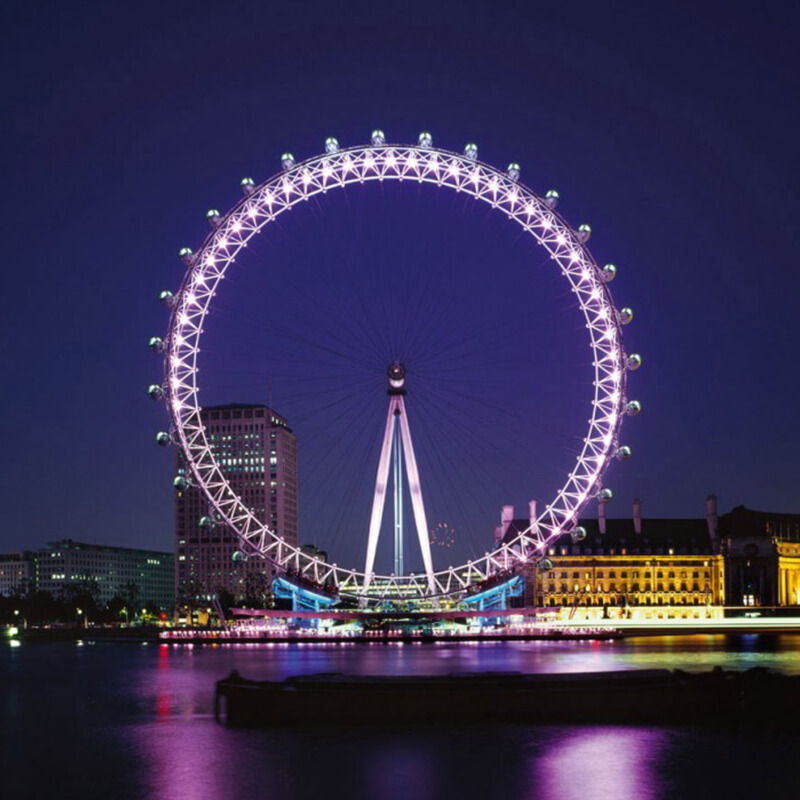 We arranged a fun packed itinerary which included a private capsule experience on the London Eye, Gin tasting, a guided tour of Blenheim Palace, a London river boat cruise, shopping at Harrods, a visit to the Tower of London and a coach tour of the Cotswolds. Throughout the trip we were keen to showcase the ‘Best of British’ whilst simultaneously considering the guest’s Thai traditions and preferences. Language presented its self as a barrier during the visit as only a small number of the guests could speak English, and this was still quite limited. To combat this, our FCCE team set about learning some basic Thai to communicate and provided a Thai speaking tour guide. We always feel it is important to be flexible during trips and reactive to our customer’s needs. By having a host on site at all times we were able to do this and deal with any last minute requests and changes. In fact, we re-organised a day’s itinerary to fit it in an extra Harrods shopping trip as they enjoyed that so much! 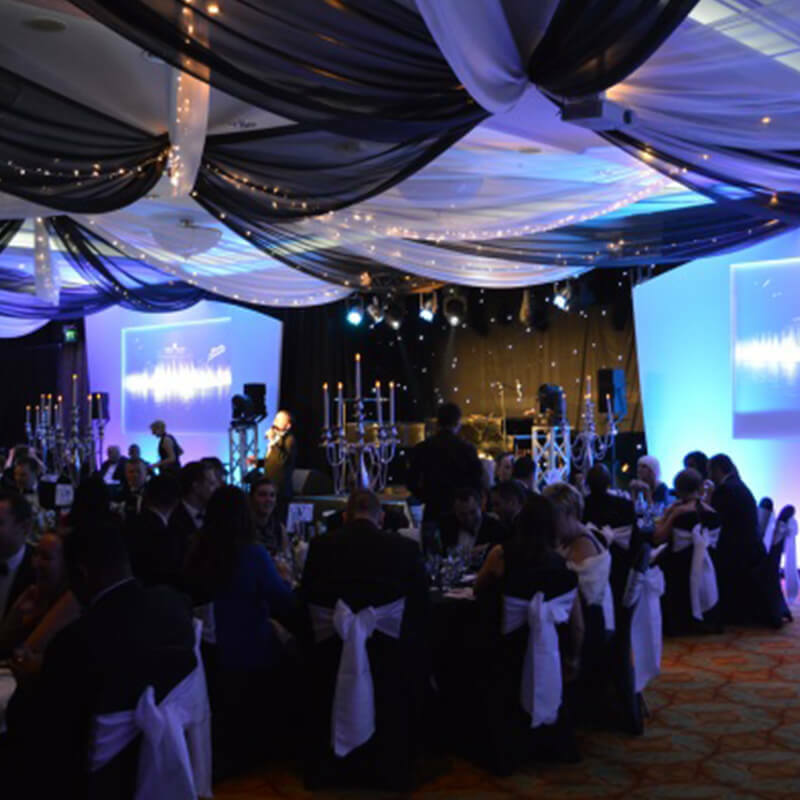 One of our clients asked us to work with them to arrange the A.V, theming and entertainment for their Annual Sales Rally. The specification was for guests to walk into the room in the evening and feel as though they had been transported to a Las Vegas Casino! We draped the room throughout with black and white voile, with a large set and stage for the presentations. The Guests were also entertained with Duelling Pianos; a fabulous act covering any requested song; they kept the dance floor filled and the guests entertained until the early hours of the morning. One of closest office neighbours asked us to support them with their Employability Conference for 2013 – having only been neighbours for a matter of weeks! The event saw 120 students from over 40 universities, schools and colleges come together. Our services included support in the event planning, venue liaison, all audio-visual requirements and a fully supported registration process along with delegate support and on-site management of logistics and registration. The event was such a success that the client gave us the brief for the next incarnation of the event straight afterwards and with even more services being provided by us! 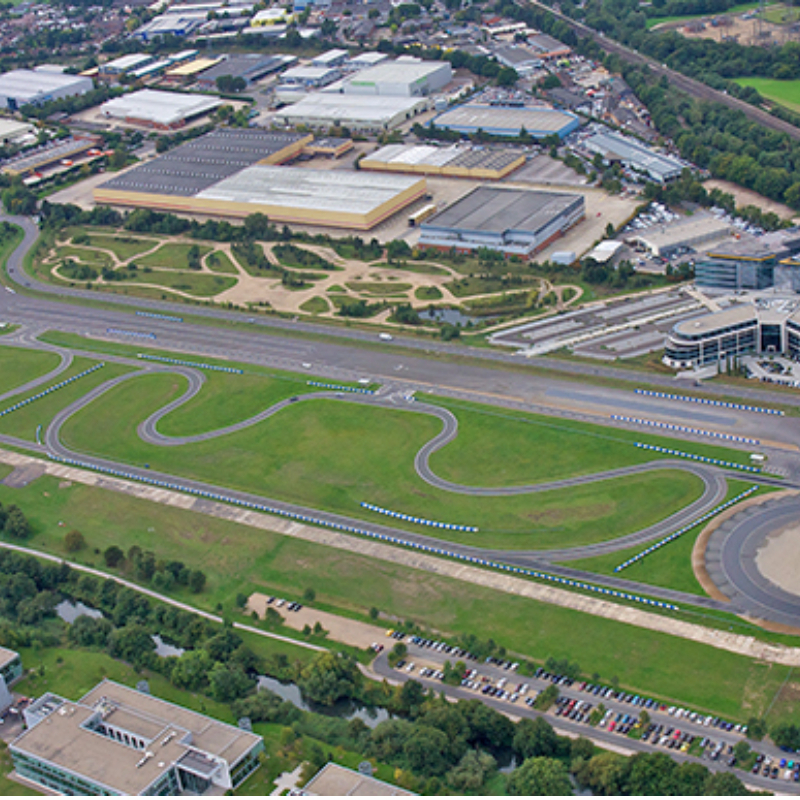 We arranged an exclusive Russian-themed Christmas Party for 800 guests in a marquee at Mercedes-Benz World as well as on-line registration and onsite support on the night. Entertainment to include a Cossack dance troupe, aerial acrobatics, casino tables and fire jugglers! One of our long-standing local clients asked us to arrange a fun summer staff party to celebrate the company’s 40th birthday. With over 130 employees, we arranged a large traditional marquee set in the grounds of the headquarters. We brought in a fantastic local catering company and some surprise entertainment! We planned a lunchtime BBQ and the weather being hot and sunny was the perfect accompaniment. The guests welcomed the chance to relax and celebrate their hard work. They thoroughly enjoyed the ‘Crashing Waiters’ surprise entertainment and several volunteers got involved with the music and dancing, much to everyone’s delight. The celebration event was a huge success and we wish them all the best for the next 40 years! 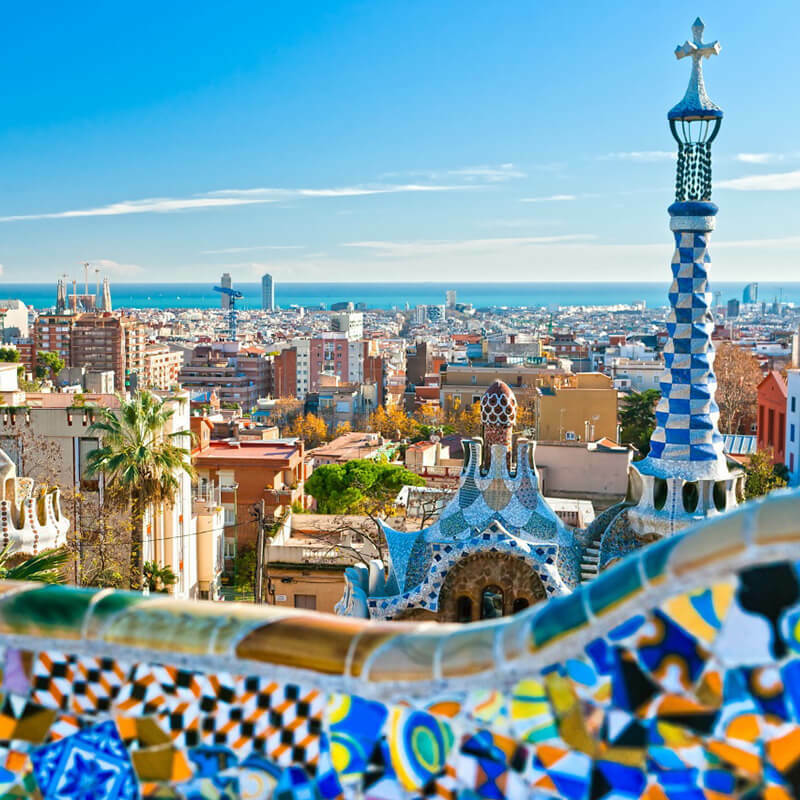 Daniel & Laura jetted to Barcelona to project manage one of our client’s European Users Conference, which sees delegates attend from all over Europe. The conference kicked off with a drinks reception of Spanish canapés and Prosecco. The next morning was a full day of seminars and lectures and a spectacular dinner. 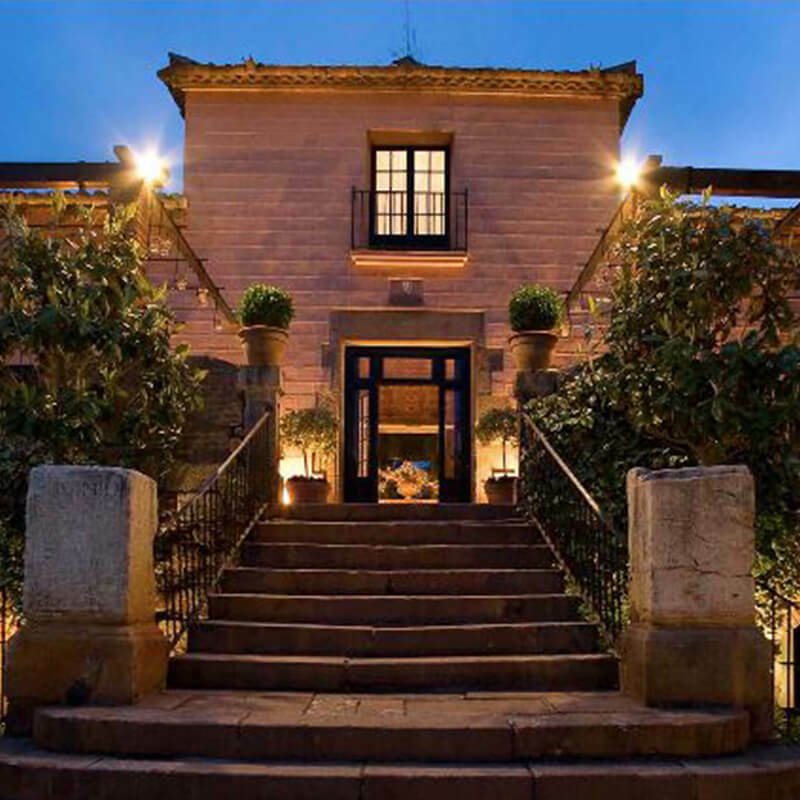 The guests were transported to La Torre dels Lleons, a 16th century building situated just outside Barcelona. It has the characteristics of a typical Catalan farmhouse and with exclusive hire it was perfect for a group of 100 guests to experience authentic Spain! Guests filled the courtyard on a warm evening with sparkling wine and traditional Rumba Dancers, before moving into the vaulted cellars for a sumptuous 3-course dinner. The evening ended with more flamenco and rumba dancing and singing, and the guests were encouraged to join in! Our services for this event included event planning, venue liaison, audio-visual requirements, off-site dinner, transport planning and on-site management. The event was such a success that the client has already provided the brief to us for the Conference the following year in Berlin! One of our local clients asked us to arrange a fun staff party, to celebrate the product launch of an exciting new product. 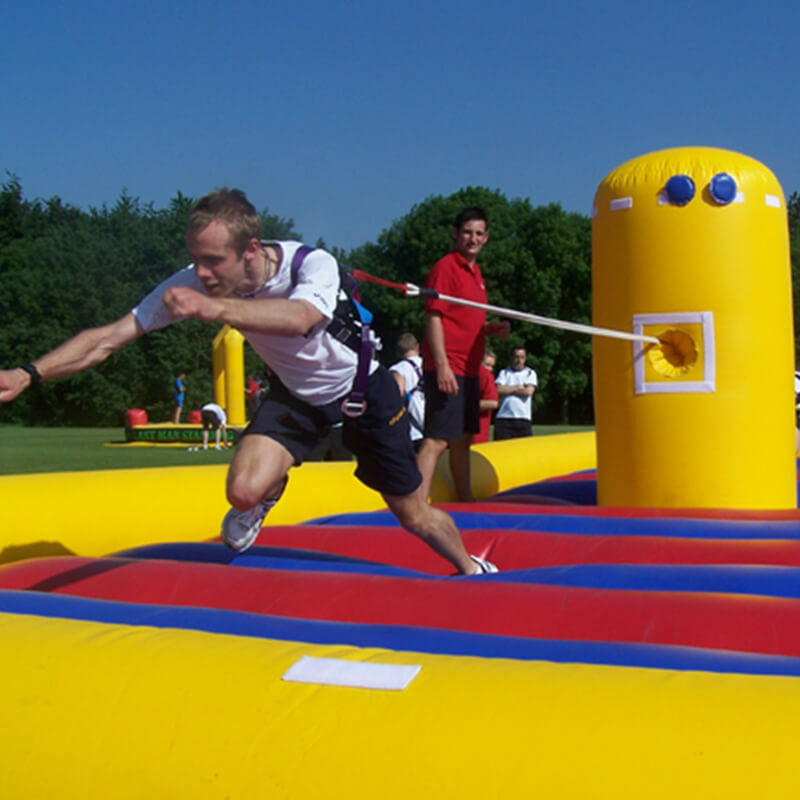 To enhance the theme of the product, we brought in some fun entertainment – a Bunjee Run and a Velcro Wall where keen staff dressed in Velcro suits and throw themselves against a sticky wall! For the less adventurous, there was also an indoor game of Twist Air where teams had to navigate balls through a sequence of hurdles using high power airjets! We were fortunate with a mini heatwave, so guests then enjoys a themed Pimms tent and an extensive BBQ on a terrace area overlooking the lake and golf course. Everyone had a great evening and we look forward to planning future events and checking out their new products! 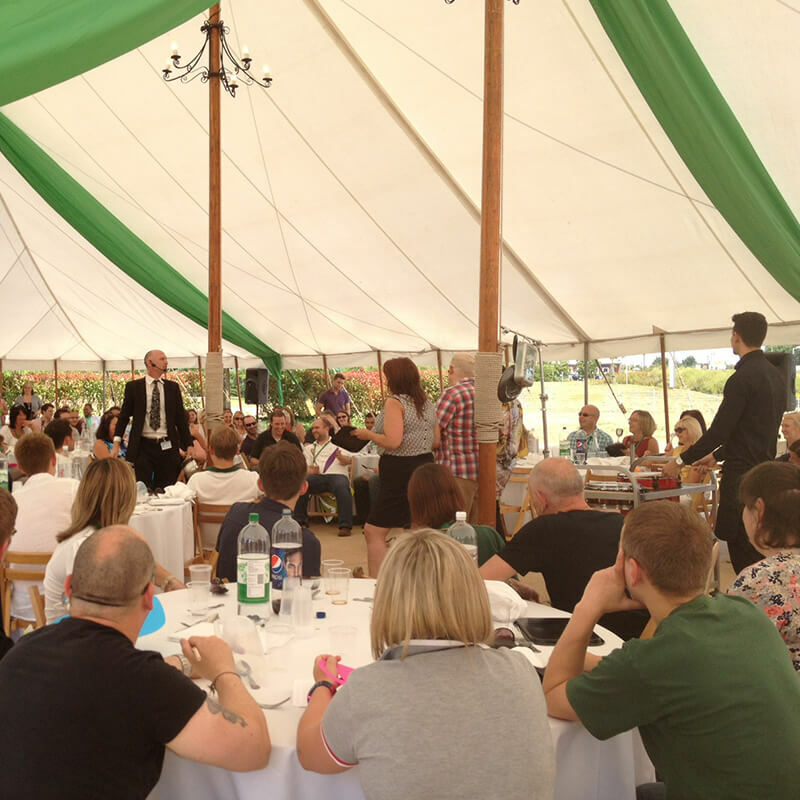 We planned a fantastic Annual Company Away Conference for 30 delegates plus their partners. The event was for three days and included business and social aspects including a finale formal dinner.